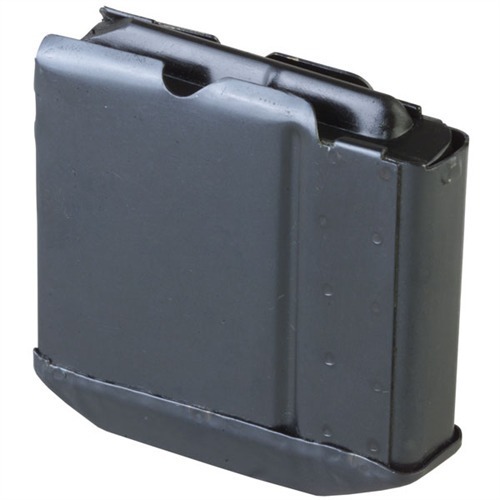 Durable high-capacity magazine provides a long service life and holds ten rounds for fewer reloads when shooting your Remington 740, 742, 750, or 7400. Folding, leaf spring and nylon follower ensure reliable feeding. Available in .30-06 and .308. SPECS: Steel, blued. Approximately 31⁄2" (9cm) wide, 37⁄16" (8.7cm) high, 1" (2.54cm) thick. Fits Remington 740, 742, 750 & 7400. Artículo revista de alta capacidad proporciona una larga vida útil y posee diez rondas para las recargas menos fotografiar su Remington 740, 742, 750 o 7400. Plegable, ballesta y seguidor de nylon aseguran la alimentación confiable. Disponible en.30-06 y 308. Especificaciones: acero pavonado. Aproximadamente 31 ⁄ 2"(9cm ancho, 37) ⁄ 16" (8.7 cm) de alto, 1"(2.54 cm) de grosor. Cabe Remington 740, 742, 750 y 7400.
bought for my rem750 in .270 win. ammo loads well, mag fits like a dream and no problems with jams, ftf, etc up to this point. This is an awesome addition to my Model 742 and let me tell you, I feel much more comftorable in the woods hunting hogs than with the stock 4 round clip. I fired off 20 rounds in each of the two clips that I purchased and both fired and loaded flawlessly. The one draw back is that I have to hold the action open when I insert the clip in order for it to be fully inserted. Not a big deal for me and I would buy this product again and again. The lack of bolt hold open is a non-issue in the Remington 7600. My particular magazine had a rough start with some extra metal that caught on case mouths as they were fed, but 30 seconds with a Dremmel tool solved that nicely. I traced the contour from the front of a factory mag onto this one and ground to match. Too bad Triple-K didn't do the same at the factory. After cleaning up the front of the magazine I've had no further problems. The spring holds tension well when left loaded. My example has remained loaded for the last 6 years and still feeds rounds as fast as I can shuck the action. I was glad of purchase I made from Italy, so that my friends who have also a Remington 7400 luxury carbine .30-06 I prayed for them to buy the magazine from 10 shots. I bought 2 of these for my remington 7400 to use at the gun range, the quality is ok but not as good as factory. It needs a little manhandling to get it fully seated into the rifle. I would've like to seen all metal used in the construction (the follower is plastic and has alot of play front to back) The biggest problem I have with it is that it holds the bullets down too long and they mash into the bottom of the feed ramp causing a jam and deformed bullit tips. I use it in my 742, 30-06. I initially found that it bound my bolt. I needed to take it to the grinding wheel (Dremmel) to match my original Remington clip. A few strokes with the grinder and now it feeds properly. Good buy. ran 50 rounds through it in one session, no misfeeds, worked like a champ. I have cleaned my rifle, also cleaned both of my 4 and 10 round mags. My rifle shot fine with the 4 round mag, but it would not shoot 3 times in a row with the 10 round mag. It even broke to tip off of 1 of my Ballistic Tip bulletswith the 10 round mag in, the action feels slower like it is dragging. Putting both clips aft end towards each other you can see the original mag is a mil or 2 wider at the feed point. Perhaps thats the problem? Maybe it can be bent? Recently bought two of these 10 round magazines for my 30-06. Bought this for a REM 7400 the clip holds the shell down to long and jams every time. The indents on the side of the clip that raise the bullet is to far forward about a 3/16 in. compared to the clip I use a 280. Might work with bullets that have a very short nose on them or other models. I had a very hard time finding spare or aftermarket magazines for my 7400, either standard or high capacity. It can be a pain at the range to constantly stop shooting and reloading a single four round magazine. It's hard to relax and enjoy what you're doing when you need to constantly stop and reset everything. I was happy to finally find one at Brownells. I ordered two of the ten round magazines, and I love them both. They both work perfectly, and they fit and function more smoothly than the original. Reading the other reviews, it seems that people either love them or hate them. It could be that they have some quality control issues, and I might have caught them on a good day. It's possible they only work well in the 7400 / 7600 models, or maybe just in mine. All I can offer an opinion on are the ones I received, and I'm firmly in the "love them" group. I'll be ordering a couple more as soon as they're back in stock. These mags don't load, seat & cause the bolt to jam in Remington Model 742. None of the 7400 series mags seem to fit, load or properly operate either. Keep looking for actual Remington 742 mags otherwise you're just waisting time & money. The bolt won't cycle if there's more than one round in the mag, won't take more than 5 rounds, the mag takes a lot of force to go into the well which means it doesn't fit.. Also, there's no bolt release on it. I don't know whether to return them or just throw them away because I know it's my civic duty. I had purchased mine and was stoked to get it but first day at the range and it jammed on every round. I did figure out why, it seems the indents in the side of it were to far forward to assist the round into the feed ramps on my 7400, I was able to get some durable epoxy to stick and made a spot on each side to assist the rounds. The quality seems pretty good, put together well just the slight tweaks and it would be a 5 star. Other then the slight issue it works pretty good and fits pretty well but hope who ever makes them can see these and make the proper improvements to make it a great magazine.